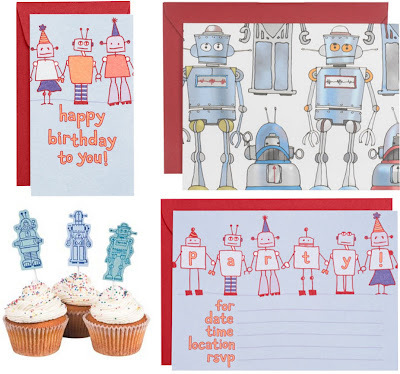 If you're planning a robot birthday party, start your search at Paper Source. Over the weekend I spotted these friendly robot gift tags and party invitations. They also carry several robot rubber stamps, and one of their creative suggestions online is how to turn them into cupcake toppers: just stamp an image on heavy weight paper, cut around the outside of the design and adhere a toothpick to the back. It's so easy, and your kids will have fun helping you stamp!